Hey folks welcome to another edition of our theme roundup. If you developed a theme you want to share or see featured in the contest or discovered a really great one out there by all means shoot it on over to us! Submit your tips and suggestions to themeroundup[at]crackberry.com for consideration. I hope you enjoy this week's picks so be sure to click on the jump to check them out. Colors by Julnt Designs is not just one theme, it's actually 8 themes in one. It lets you change the color of the banner with just the press of a hot key and looks absolutely stunning on select OS7 devices. Whether you're a fan of green, yellow, white, pink, purple, orange, red, or blue this wallpaper friendly theme is sure to keep you occupied for quite some time. You can pick this up from BlackBerry App World for $1.99. It's available for BlacBerry 9810 and 9900/30/81 running OS7/7.1. Fuzz is the latest and greatest theme by popular developer HedoneDesign and as they so boldly announced on twitter it's your new theme. It features awesome icons and detailed dark graphics combined with blue focus images. Named after their FUZZengine application developed by their i-Mentalist division this theme is absolutely gorgeous and one you shouldn't pass up. 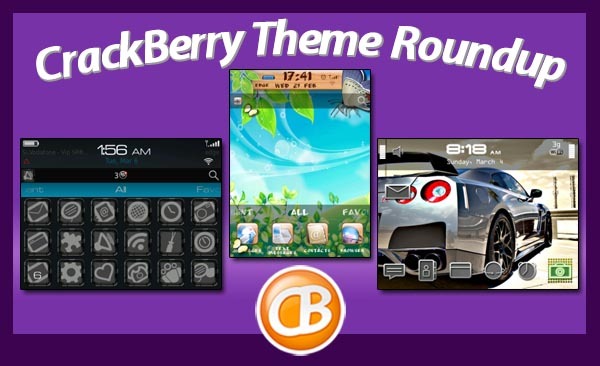 There's a reason why CB named them 2010 Theme Developer of the year so why not head on over to BlackBerry App World and find out why for $6.99. It's compatible with BlackBerry 9300/30, 9650, 9700/80/88, and 9800 running OS 6. For those who say there's not enough manly themes out there then check out Speed Custom by Raypho. With hideable and Porsche Design custom icons and wallpaper this is an excellent looking theme that takes advantage of the high resolution display on your device, especially for all you Torch owners out there. Speed Custom is compatible with BlackBerry 8350, 8520/30, 8900/10/80, 9000, 9100/05, 9300/30/50/60/70/80, 9500/20/30/50, 9630/50/70, 9700/80/88/90, 9800/10/50/60, 9900/30/81. So cruise on over to BlackBerry App World and grab this for $1.99. If you're looking for a theme to switch off of stock then why not check out CuteMonsters, a free theme by themeArt. I'm not going to lie, it's an adorable theme with its cute monster wallpapers, custom icons, fonts, and bright colors. CuteMonsters is available for BlackBerry 8300/30/50, 8520/30, 8800/20/30, 8900/10/80, 9000, 9100/05, 9300/30, 9500/20/30/50, 9630/50/70, 9700/80/88, and 9800. It never ceases to amaze me how theme developers come up with their fantastic creations to satisfy the needs of all the theme lovers out there. 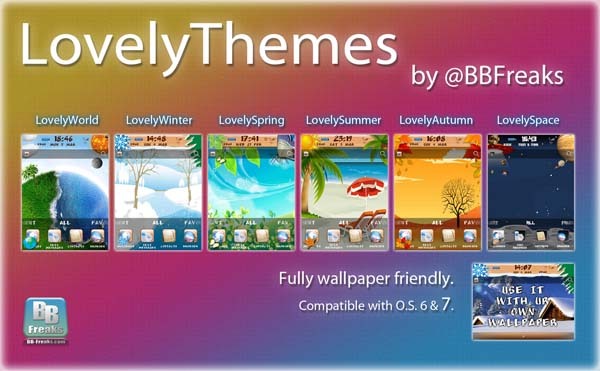 BB-Freaks are no different and once again dazzle us with their newest series simply titled LovelyThemes. Not one, not two, but a series of six sharp looking themes encompassing the different seasons as well as renderings of the globe and outer space. It's a sensory overload if you ask me. Each of these impeccable wallpaper friendly themes feature matching custom wallpapers, amazing looking icons, and are great to use all year round. They are compatible with most Blackberry devices running OS6 and OS7/7.1 (9100/05, 9300/30/50/60/70/80, 9650/70, 9700/80/90, 9800/10/50/60, and 9900/30/81) for only $.99 each.